Home / NASA / Physics / Science / An Earth -Like Planet Only 16 Light Years Away? An Earth -Like Planet Only 16 Light Years Away? Earth may have a new neighbor, in the form of an Earth-like planet in a solar system only 16 light years away. The planet orbits a star named Gliese 832, and that solar system already hosts two other known exoplanets: Gliese 832B and Gliese 832C. The findings were reported in a new paper by Suman Satyal at the University of Texas, and colleagues J. Gri?th, and Z. E. Musielak. Gliese 832B is a gas giant similar to Jupiter, at 0.64 the mass of Jupiter, and it orbits its star at 3.5 AU. G832B probably plays a role similar to Jupiter in our Solar System, by setting gravitational equilibrium. 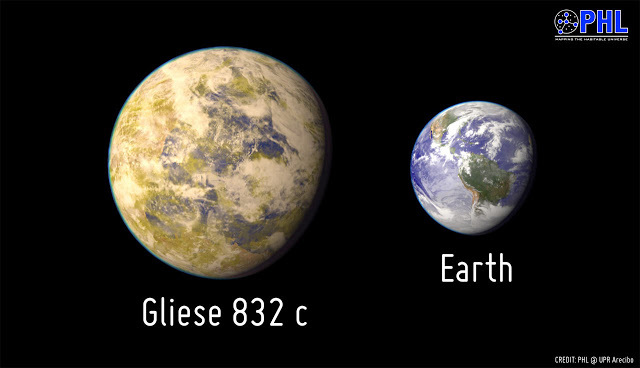 Gliese 832C is a Super-Earth about 5 times as massive as Earth, and it orbits the star at a very close 0.16 AU. G832C is a rocky planet on the inner edge of the habitable zone, but is likely too close to its star for habitability. Gliese 832, the star at the center of it all, is a red dwarf about half the size of our Sun, in both mass and radius.The newly discovered planet is still hypothetical at this point, and the researchers put its mass at between 1 and 15 Earth masses, and its orbit at between 0.25 to 2.0 AU from Gliese 582, its host star.